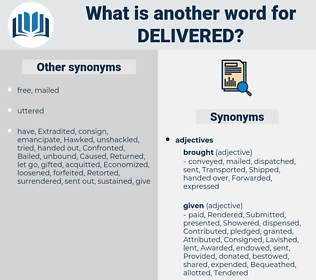 What is another word for Delivered? rules, offers, materials, Commodities, Does, outputs, goes, Forms, Deliveries, goods, Rendered, Provided, Delivering, handed, Issued. derived, Lived, discovered, distributed, Yielded, described, declared, articulated, demonstrated, hand-over, Introduced, issues, Transferred, Transferring, circulated, guaranteed, Participated, recovered, transmitted, determined, pledged, Contributed, received, forwards, Forwarded, Supplied, delayed, Existed, Arrived, Testified, advised, Presided, broadcasts, Communicated, Brought, revealed, acknowledged, drove, involved, recorded, removed, Deposited, inspired, directed, Wrote, facilitated, Responded, Tendered, acquired, organised, broadcast, broadcasted, accordance, conferred, verified, Attributed, reproduced, unveiled, formulated, Procured, handled, lay, Explained, conveyed, informed, promised, filled, realized, rose, invested, Filed, endorsed, led, Caught, dispatched, ruled, Dealt, uttered, Fielded, left, Referred, Suffered, allocated, expressed, Was, Were, included, summarized, mailed, arranged, voiced, promulgated, Undertook, Carried, restored, proved, Indicated, designed, committed, advanced, relocated, mile, proposed, fed, decided, ascertained, realised, organisation, moved, registered, Adjudicated, represented, Managed, concluded, identified, outlined, spearheaded, reported, Transported, read, reading, Ceased, Volunteered, Enabled, briefed, initiated, Followed, relayed, Succeeded, relation, traveled, travelled, earned, dictated, Reached, Leveled, Levelled, spoke, replaced, observed, speech, encouraged, instructed, Lodged, Resulted, showcased, shared, Proceeded, spent, organization, recognized, conceded, approved, Promoted, raised, finalised, secured, attended, learned, prepared, recommended, Served, admitted, contained, laid, thousand, turned, Worked, imposed, Drafted, Displayed, highlighted, nominated, produit, Operated, Viewed, adopted, Appeared, pursued, Flew, suggested, Discussed, added, donated, abandoned, Convened, Embarked, Incurred, entrusted, drew, affirmed, agreed, required, streams, Entered, emit, Launched, Benefited, Spilled, enhanced, struck, signalled, accepted, elaborated, dictation, Dragged, maintained, enlisted, found, aired, Mentioned, licensed, assumed, Instituted, moderated, dropped, experienced, Killed, fired, announced, Ceded, exposed, rushed, authorised, Enacted, reunited, Commented, Gained, output, Bought, stopped, Flowed, awaited, Told, Came, Cited, Adduced, Accorded, reassured, Threw, posed, Questioned, licence, Remained, charged, honoured, felt, reserved, applied, Began, Lobbed, permitted, asserted, opened, monitored, Argued, used, Fought, Knocked, Took, noted, respected, Scored, Prompted, faced, bet, Notified, ascribe, Exhibited, taught, Waged, played, Quoted, Voted, need, postponed, Visited, shot, accessed, Sentenced, Consigned, blamed, Searched, featured, psyched, started, tabled, Returned, Pushed, Poured, heard, saw, figured, effected, Had, cast, headed, listed, accused, Stood, won, pulled, placed, Caused, lu, planned, pointed, focused, focussed, Toured, hurt, Allowed, contested, Claimed, put, showed, sponsored, centred, Stayed, Loaned, posted, staged, Tossed, allotted, Plunged, Met, Mouthed, Became, said, formed, Passed, kept, closed, booked, Did, Doing, funded, called, Went, stated, Asked, let, Wished, Accounted, Acted, Got, Meant, tried, wanted, named, Rendered, handed, Issued. derived, Lived, declaration, discovered, L, distributed, Deployed, Yielded, described, addressed, Devolved, declared, articulated, Engendered, demonstrated, detailed, deprived, Introduced, operationalized, deferred, Devised, Retrieved, incorporated, relieved, Translated, Transferred, circulated, dissolved, guaranteed, integrated, Participated, fulfilled, recovered, preferred, Divulged, Extradited, transmitted, coordinated, triggered, determined, pledged, rehabilitated, Contributed, received, Materialized, depicted, withdrawn, manufactured, devoted, divided, distribution, destroyed, gathered, Accommodated, Forwarded, Supplied, revived, Radiated, delayed, Arrived, ordered, considered, Defended, advised, advertised, drilled, categorized, Provisioned, dedicated, defined, Communicated, driven, Brought, revealed, dispersed, acknowledged, Disseminated, redirected, Delegated, reintroduced, rid, redeployed, written, involved, dispensed, administrated, Progressed, illustrated, diverted, enforceable, recorded, removed, Deposited, murdered, inspired, Replicated, directed, materialised, Denominated, facilitated, Responded, Tendered, acquired, Eliminated, organised, Adhered, broadcast, broadcasted, detected, conferred, verified, remediated, Attributed, performance, unveiled, formulated, Procured, handled, Disbursed, resolved, Originated, Detained, Investigated, Overseen, Explained, rescheduled, risen, conveyed, informed, predicted, covered, disclosed, promised, filled, concentrated, Retailed, realized, Compiled, invested, divorced, Filed, abided, endorsed, led, reflected, initiative, Caught, Enshrined, safeguarded, dispatched, decreed, ruled, Dealt, uttered, reconditioned, simple, left, designated, Upheld, Replied, Referred, utilized, allocated, Injected, expressed, expedited, reintegrated, embodied, Constructed, included, disposed, publicized, imported, relinquished, enforced, Hanged, proven, mailed, arranged, voiced, Hurled, collected, scattered, Undertaken, promulgated, reviewed, Denied, Complied, governed, Carried, restored, proved, Indicated, finalized, calibrated, designed, violated, interpreted, re-established, committed, activated, subprogramme, terminated, Bred, sold, Purchased, exploited, attained, prescribed, advanced, relocated, dismissed, proposed, conceived, fed, spread, loaded, updated, Excluded, decided, ascertained, ended, desired, realised, sustained, moved, registered, appropriated, Adjudicated, smuggled, represented, Managed, discharged, destined, concluded, identified, Answered, extended, outlined, spearheaded, hired, reported, Curricula, extinguished, Transported, credited, edited, read, connected, Advocated, portrayed, equipped, Enabled, repaired, refurbished, Negotiated, treated, confirmed, Harvested, authorized, issuance, regulated, Exported, Targeted, frustrated, initiated, Followed, motivated, invited, Relied, relayed, Entailed, spoken, Obtained, Sped, service, serviced, services, Captured, Succeeded, induced, corrected, inherited, Regarded, complemented, traveled, travelled, earned, dictated, Reached, educated, Sacrificed, transposed, measured, Inserted, Levelled, replaced, anticipated, statement, Arisen, observed, speech, indicators, failed, encouraged, apportioned, instructed, guided, Preached, powered, Afforded, judgement, Deemed, Lodged, Resulted, Vacated, adapted, Perpetrated, showcased, employed, shared, healed, deposed, saved, spent, located, organization, recognized, Culminated, assigned, bound, tailored, learning, Recruited, approved, Promoted, retained, calculated, discarded, scheduled, raised, infected, consumed, Spared, secured, renewed, repeated, attended, mediated, Repaid, learned, diffused, implied, financed, lost, practised, prepared, recommended, Contravened, Served, born, Borne, composed, Worded, versed, foreseen, admitted, restricted, contained, preserved, laid, quality, Flown, printed, turned, documented, Worked, imposed, split, expanded, Curtailed, Drafted, aided, cost, Displayed, animated, accompanied, amended, Seconded, highlighted, nominated, seized, Operated, Viewed, adopted, Appeared, pursued, Meted, inscribed, sworn, suggested, drawn, Discussed, Revoked, added, entitled, Challenged, imprisoned, bid, forecast, donated, abandoned, Toppled, Convened, Embarked, escalated, Tackled, absolved, Incurred, entrusted, Emitted, linked, Obeyed, protected, arrested, reacted, specified, Assessed, agreed, exchanged, Waived, required, vested, populated, Entered, Helped, sung, framed, Launched, adjusted, Benefited, recaptured, Spilled, settled, enhanced, satisfied, Marketed, Judged, Examined, struck, accepted, elaborated, mandated, stored, maintained, grown, Enjoyed, found, witnessed, aired, Installed, Mentioned, licensed, judgment, assumed, Instituted, Bundled, moderated, dropped, experienced, Shifted, Killed, Trafficked, fired, Leaked, Enumerated, programme, undermined, announced, Construed, exposed, intended, rushed, authorised, Enacted, Undergone, Betrayed, Adjourned, worn, come, engaged, routed, structured, reunited, trained, thrown, Gained, Exerted, stopped, rescued, data, convicted, assisted, Told, qualified, Cited, Adduced, Accorded, reassured, signified, obliged, projected, continuity, posed, Exercised, Questioned, affected, contracted, Begun, Earmarked, Remained, freed, charged, honoured, felt, Aimed, dumped, threatened, Channeled, Channelled, ducted, commissioned, applied, alleged, changed, refunded, bestowed, Fitted, Aborted, permitted, processed, expected, taken, opened, monitored, Argued, used, fallen, Summoned, selected, Fought, Heightened, acquitted, wasted, Consented, concerned, limited, noted, aligned, obligated, Slated, follow-up, respected, elapsed, Ascribed, finished, Scored, Prompted, enclosed, expended, Piped, packaged, Exempted, Consulted, Cared, Notified, copied, attached, Piloted, sourced, notice, Phrased, Exhibited, taught, Waged, played, access, Quoted, suited, geared, Voted, auctioned, Supplemented, postponed, Visited, shot, functions, accessed, Sentenced, Consigned, paid, Spawned, seen, featured, started, tested, tabled, franco, Beamed, excused, rebated, Returned, Pushed, Poured, heard, escaped, forced, pleased, effected, reopened, Touted, honored, authored, Had, cast, headed, Sited, halted, listed, actioned, Resumed, opposed, accused, Resorted, won, HIT, continued, placed, Caused, planned, pointed, shaped, welcomed, focused, focussed, height, Subjected, blocked, Allowed, Chaired, Shown, contested, Claimed, supposed, put, Happened, sponsored, centred, Loaned, Mooted, artwork, posted, Talked, Scanned, controlled, cashed, allotted, become, punished, Met, founded, opted, chosen, 151, Approached, said, packed, Programs, programmed, formed, Passed, studied, kept, requested, worried, sought, known, Couched, funded, gone, called, stated, Asked, backed, contacted, 2008-2009, aged, staffed, accounts, Accounted, Acted, thought, Gotten, Got, based, Meant, tried, cut, named, Rendered, Provided, handed, Issued. Deployed, Administered, addressed, surrendered, fulfil, fulfilled, Achieved, ordered, Disseminated, dispensed, disclosed, organized, accessible, Replied, Imparted, executed, executes, Complied, extended, Obtained, Helped, engaged, attached, paid, offer, pronounced, Provided. 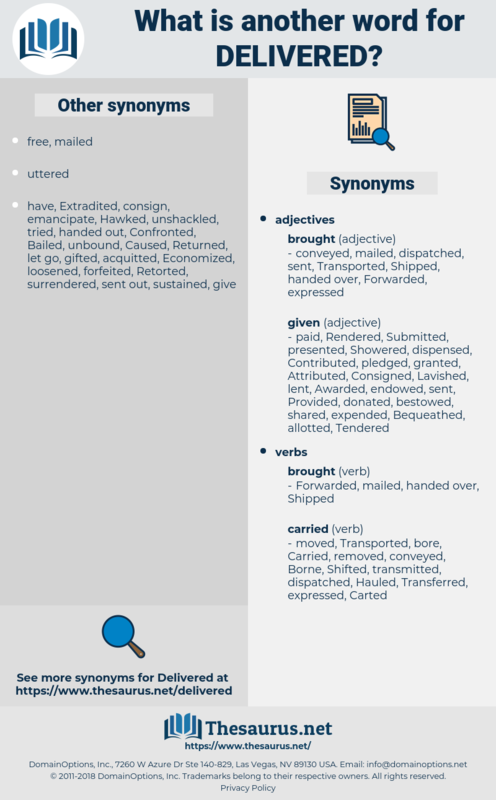 Administered, surrendered, Achieved, organized, Imparted, executed, pronounced. After giving him sufficient time to get quietly seated, Kinch followed, and delivered the clothes left with him the evening previous. As the note had been delivered to Dr. Raymond he had considered it only courtesy to accept the kindness. Day Labourer, deliverer, day laborer, delivery.